Getting affordable, top-quality Photos of your work can be a nightmare but it is essential. In Osprey Studio’s second open Photo-Shoot TV Cameraman Stephen Foote (http://www.stephenfootephotography.co.uk/) will talk you through the images he takes with his posh (very) camera and also guide you to take good images with your own camera using ordinary ,domestic accessories and lights. It will be an intense day ( do bring a note book) but very rewarding. You will get a minimum of 6 publishing-quality images in digital form to use in any way you want and the pictures you take yourself. And you will go home with a good understanding of how to improve your photography in your own Studio. We will start at 9.30 am. Bring something to share and we will have a relaxed Pot-luck lunch and there will be tea, coffee, or soft drinks available all day. I learnt a great deal last time talking shop with the other Makers. It was a lovely day. Let me know as soon as possible approximately what work you will bring so we can be well prepared. There is parking right in front of the Studio. For info and directions click ‘Visit The Studio’ to your left. There are only 6 places so do book early. 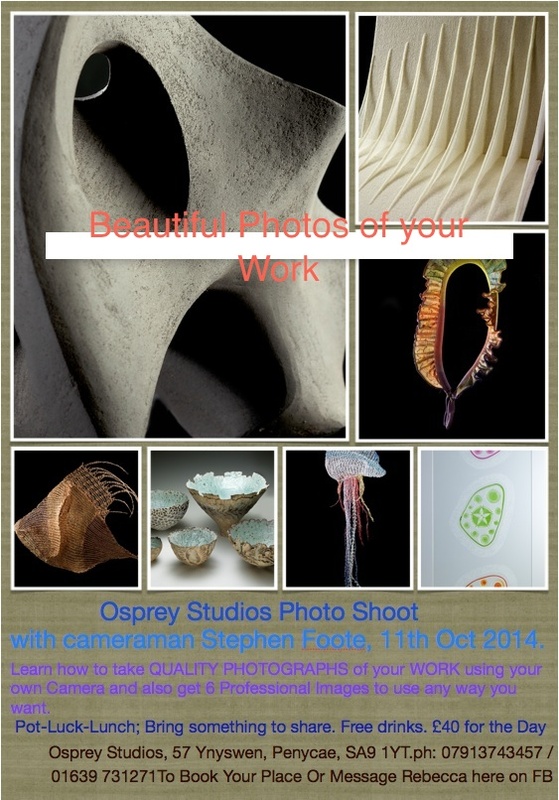 This entry was posted in Events, Visit the Studio and tagged Affordable photos of sculpture, Open Photo Shoot, Osprey Studios, Rebecca Buck, Rebecca Buck Sculpture, Sculpture, Stephen Foote, Stephen Foote Photographs, Wales. Bookmark the permalink. ← Studio Diary; Landscape Project pt 2.